Ever heard of a sheep who doesn’t feel like a sheep? That’s me. I never knew my mum so I was brought up on a bed and breakfast on the Isle of Skye. That’s why I had to go and look for a place where I really belonged. And these are my stories, written for you and anyone else out there who is searching for that little bit of grass they can call home. 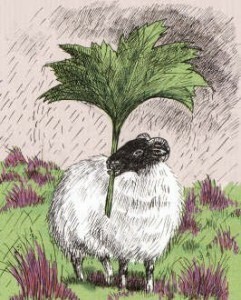 These books are a series of humorous and intriguing stories about Skye the sheep and her endearing family. They will make you laugh and they will make you think. They will captivate you and comfort you and make you look at the world in a different way. Here on this website you can buy the books, order the greeting cards or find out more about the projects we are involved in. There’s also a unique fair-trade sheep bag you can buy. Please have a look around our website and do get in touch with us if there’s anything more you would like to know. We would love to hear from you! If you would like to receive updates about A Sheep called Skye straight to your inbox, please click here .